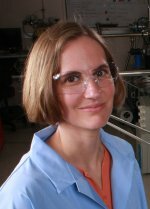 Congratulations to Tiffany Kaspar, Tim Droubay, Mark Engelhard, Ponnusamy Nachimuthu, and Scott Chambers of Pacific Northwest National Laboratory and Steve Heald of Argonne National Laboratory on having their frontier advancing research highlighted in Nature Materials, July 2008. This research was selected because it advances the understanding of zinc oxide with added cobalt, a highly controversial and heavily studied material purported to be a high-temperature diluted magnetic semiconductor. These materials are needed for semiconductor spintronics, a nascent field responding to the physical constraints of miniaturizing computer circuits. Spintronics avoids many limitations by carrying information via the spin of an electron rather than the charge. To make spintronics a reality, semiconducting materials that are intrinsically magnetic at room temperature are needed. Zinc oxide doped with cobalt ions to create the magnetism is under consideration. The team synthesized and analyzed crystalline films of the material using equipment in the Department of Energy's EMSL, a national scientific user facility at PNNL. The team demonstrated that when well crystallized, the material is magnetic only because of trace quantities of cobalt metal that form near the film's surface. Further investigation at DOE's Advanced Photon Source identified one of the elemental cobalt phases as cobalt-zinc. This work represents state-of-the-art crystal synthesis and materials characterization, both of which are needed to gain sufficiently in-depth understanding to move the field forward. As Nature Materials noted, "The message is clear: look very carefully for secondary phases before concluding that a ferromagnet is intrinsic."